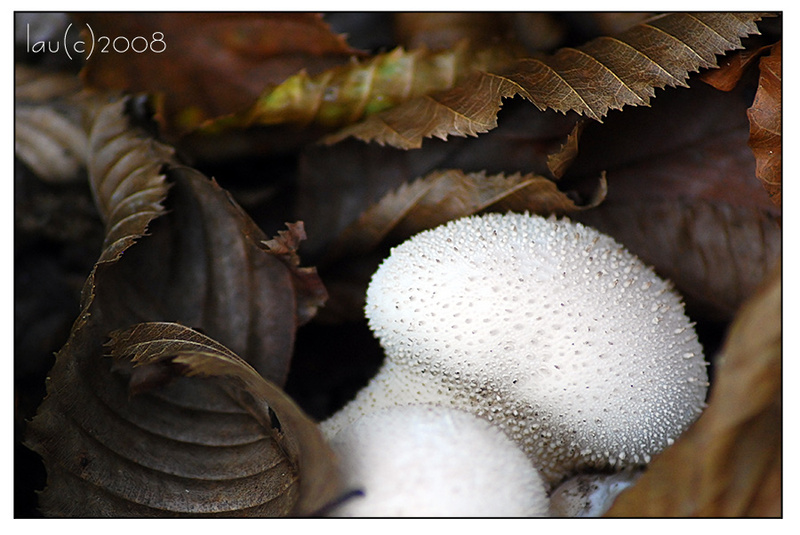 During the Photo Tour in October I came across many mushrooms. These elements of nature ( I can’t call them either plants nor animals), have beautiful shapes and sometimes amazing colors. Most of the time I came across groups of mushrooms hidden in the death leaves. How you “see” your subject will portray the way it looks on film. No matter how exact your camera settings may be, your photographic “eye” will epitomize the concept. Consider your options when photographing your find. This is where you should try to photograph the mushroom in its natural state and habitat while disturbing the area as little as possible. Try capturing the species’ true essence and appearance as it most likely will present itself to others in the field. Even with the best intentions, a little manipulation is usually prudent to produce a good photograph. 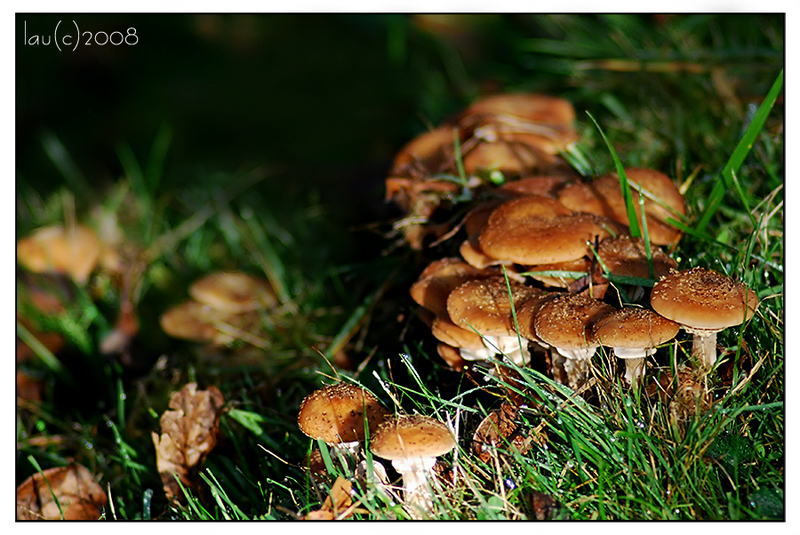 A blade of grass, a twig or bit of debris may need to be removed if it comes between your mushroom and the lens. This, along with other distractions in the background can compromise your photograph. Be sure to check the viewfinder completely before taking the shot. Likewise, a nearby nut or leaf may be added to enhance a situation. Another dimension can also be added by convincing some of the local wildlife to contribute to your photograph. The other approach, documentary, is to capture the main identifying characteristics of the species. This usually requires several specimens with a more calculated manipulation of each. You may decide to tip one over to get a better view of the gills, or dig one up to reveal a hidden bulb or volva. Taking them out of their natural habitat and setting them up in a more controlled environment can also accomplish this concept. Better yet, you can try to capture their natural beauty along with depicting identification qualities. Examine your mushroom setting from all angles before deciding on the best approach. Chances are, your first instinct will be the best. Start there, and then continue to explore other possibilities. Get up-close and personal. Zoom in on some interesting details of the mushroom. Experiment with the angle of your camera and flash. The more photographs you take and experiment with, the more likely you will get something you like. Later Edit: My photo of the first mushroom won a contest. Read more about it here. There are more tips revealed in the contest’s interview.